A man accused of causing a home explosion in East Boston was ordered held on $200,000 bail Monday as he was arraigned from his hospital bed. A man accused of causing a home explosion in East Boston was arraigned Monday from his hospital bed. A judge set 28-year-old Thomas Mikula's bail at $200,000 while he recovers at Massachusetts General Hospital. He faces multiple charges, including possession of explosives, possession of an incendiary device, discharge of explosives, possession of a large capacity firearm, carrying a loaded firearm, unattended firearm, unattended ammunition, unlawful possession of ammunition, and three counts of unlawful possession of a firearm as a subsequent offense. Mikula was allegedly experimenting with chemicals in his apartment on the second floor of a triple-decker home at 88 Webster St. at 12:40 a.m Sunday when the explosion happened, blowing out the second-floor windows and forcing an evacuation of the building. Mikula, who is being treated for second-degree burns at MGH, allegedly told first responders that the explosion originated in his apartment before being taken to the hospital. 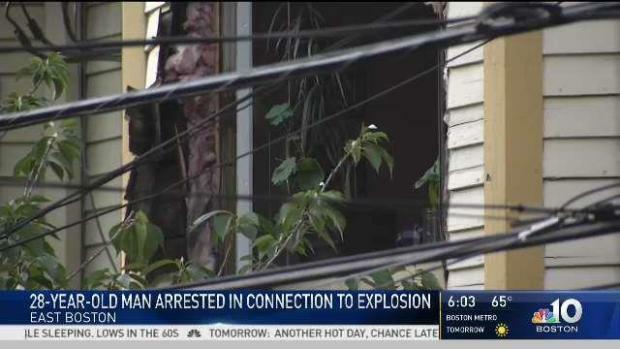 An East Boston man is under arrest in connction to an explosion that rattled a neighborhood. No other injuries were reported in the blast. Members of Boston's bomb squad unit saw evidence of materials associated with the creation of an explosive device, and responding firefighters saw weapons, according to police. A search warrant resulted in police detectives, along with FBI and ATF agents, to find and seize materials used in a homemade bomb, including PVC tubing and chemical compounds. Authorities also seized more than 100 rounds of live ammunition. "The good thing is we don't believe there's anything to do with terrorism here," Boston Police Commissioner William B. Evans said Sunday afternoon. During his arraignment, District Attorney Brian LeBlanc said Mikula was previously convicted of illegally possessing a firearm in 2009. The judge ordered Mikula be subject to home confinement and to wear GPS monitoring in the event he posts bail. Mikula was represented for bail purposes by Arthur Shabo. He is expected to appear back in court Aug. 6.